Pure white, breathable, water-based interior-paint with excellent covering power for streak-free walls and ceilings. Awarded with the Austrian Eco Label. 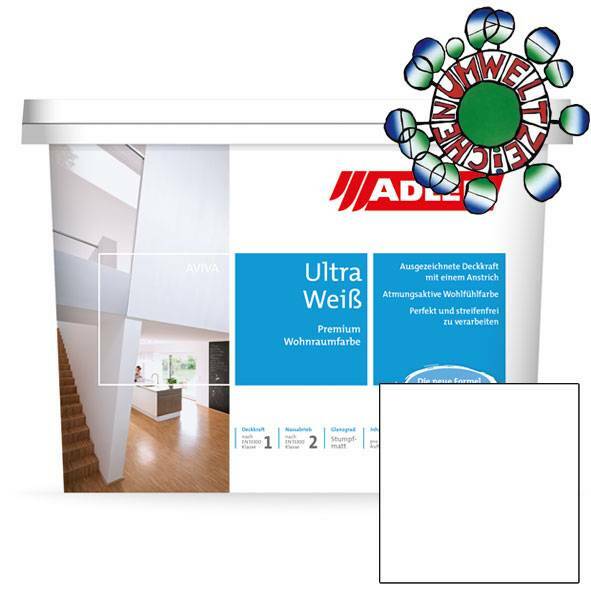 Pure white, breathable, water-based interior-paint with excellent covering power for streak-free walls and ceilings. Optimized touchup capability and excellent covering power with one coat. The highly yield and odourless product which is easy to use is formulated without any addition of solvents and plasticizers. Awarded with the Austrian Eco Label. Recommended number of paint coats 1-2. Please also see the technical data sheets! For all white interior wall- and ceiling paintings. It is particularly suitable for living rooms, bedrooms, children's rooms, offices, hospitals, medical treatment homes, schools, etc., which need to be covered up again quickly. Especially for renovation only one coat is usually needed due to the high covering power.